Multiple studies have shown that corruption particularly affects low income families and vulnerable communities. Many Colombians feel resigned to the fact that they will meet corruption in their daily lives, but the majority feel powerless to counter it. As a lawyer, Margarita witnessed how basic legal knowledge can create an enormous difference in people’s lives, and can reduce the abuse of power from people in dominant positions. Constitution of Colombia has recognised, as a human right, that any individual can present respectful petitions to public authorities or private individuals who are in powerful position. The right to petition enables individuals to request information, to the protection of their human rights when being neglected , or to access public documents. However, not all the public has the basic knowledge of these simple legal mechanisms that could easily protect them. When people feel powerless to fight against corruption, there is a culture of tolerance and acceptance of corruption. This project aims to empower vulnerable people to fight for their rights in their everyday life, to make it possible for any Colombian to use these simple legal mechanisms without needing a lawyer to support them. Corruption is the result of an abuse of imbalanced power relations. Margarita is setting up a programme to empower impoverished communities to fight the corruption that affects their daily lives through learning how to effectively use their rights of petition. She will produce educational videos together with law professionals to raise awareness and to teach participants how to get access to public information that is not transparent. She will partner with three prestigious universities in Bogota to work with local communities to identify the areas that the communications are most affected by corruption, and will support locals to use petitions. All results will be documented by video, shared via social media to inspire others to replicate the success stories and to create wider impact. The project aims to change the passive attitude that the public have toward corruption and motivate the public to support their own communications and share successful experience with the others. #1 Transfer knowledge about simple legal mechanisms that people can use to fight corruption in their everyday lives. #2 Apply this knowledge to tackle cases of corruption that affect the participants. #2 Inspire others to replicate the experiences and engage with a culture of fighting corruption. 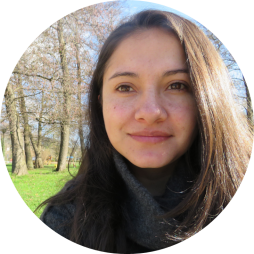 Margarita is a co-founder of a non-profit organisation in Colombia called Fundacion Koikos, which aims to empower people, who are in situations of vulnerability, to tackle everyday problems such as discrimination and corruption. After law school she worked as lawyer in Colombia for four year. She then did a Masters in Constitutional Law because she has a particular interest in Human Rights. She studied a second Masters degree in International Development in the UK, with the aim of being more qualified to contribute to projects that can improve people’s quality of life. After graduating Margartia launched a prototype of veg box in Bogota with the intention of making the food supply chain of agricultural products from small scale farmers more efficient. More recently she has gained experience evaluating projects of International Cooperation under the evaluation frame of the OECD. As a specialist in evaluation in Colombia, she became aware of the frequent abuses of governmental representatives in impoverished areas in Colombia. This experience inspired her to start a non-profit organisation to tackle the negative effects of power abuses. Follow Fundación Koikos on Facebook and on Twitter. Visit the website at fundacionkoikos.org.